It’s that time of year again, the time of year Gabe is asking regularly when we will be going back to see Thomas The Tank Engine in real life. He is my big train lover, everything is trains he spends half of his day building train tracks and playing with his Thomas and Friends Trains! Which makes this the perfect event for him to be able to attend. 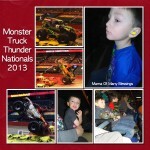 Last year was our first year attending the event, and I was so pleasantly surprised as to how many different things there are for the kids to do there. Most of the events are located outside which is the best spot for kids to be able to run and get their energy out as well. 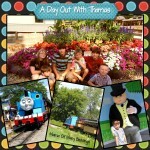 This year we will be attending Day Out With Thomas, again at the Huckleberry Railroad in Flint, Michigan. The amount of fun activities for the kids was amazing, and we quickly decided last year that we needed to get there earlier just to be able to enjoy all of the different attractions. So this year we will be getting there earlier in the day and spend the day exploring the old town and attractions they have to offer as well. Imagination Station: Stamps, temporary tattoos, hands on arts and crafts, train tables, coloring sheets. 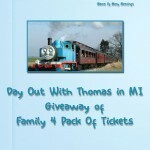 I have been provided with some fun Thomas and Friends activity pages to give your train loving kiddos, there are 3 different Thomas and Friends coloring pages as well as 2 different printable puzzles. 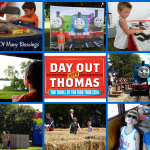 I was not the creator of these printables, if you would like more printable pages head over to the Thomas and Friends site where they offer printables of most of the engines and more! 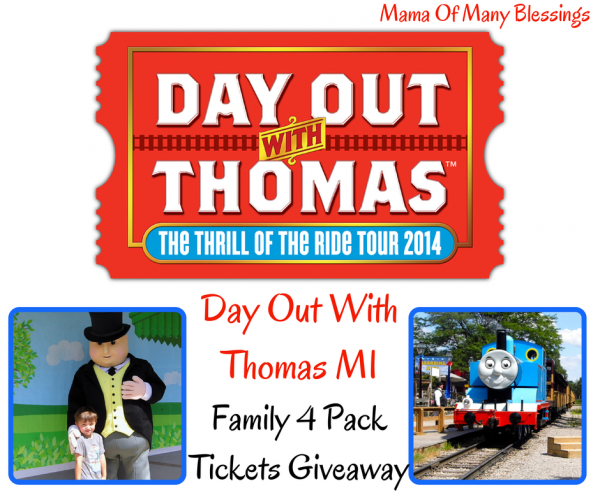 Tickets for Day Out with Thomas: Thrill of the Ride Tour 2014 are currently on sale and can be purchased from Ticketweb site, or by calling their toll-free number at 866-468-7630. You can also purchase them from the Genesse County Parks and Recreation Administration building at 5045 Stanley Road, Flint. 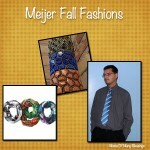 M-F 8am-5pm or at Crossroads Village and Huckleberry Railroad, 6140 Bray Road, Flint, Wednesday through Sunday, 10am-4pm. 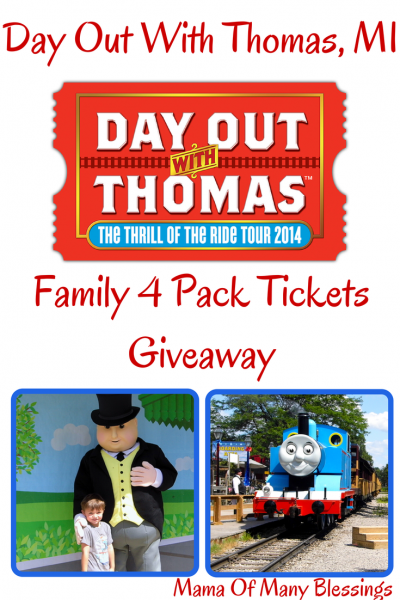 Tickets are $21 plus tax for ages 2+. For further information or directions, you can contact Crossroads Village and Huckleberry Railroad at 800-648-7275 or visit Genesee County Parks. 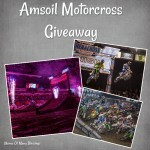 I have been given a Family 4 pack of tickets to giveaway to 1 of my lucky followers. To get entered to win use the Rafflecopter linky below. This giveaway will be open through August 9th. I will be drawing the winner using Random.org and will contact them via email, If I do not get a response within 24 hours I will draw another winner. There are many different ways to enter you can do as few or as many as you would like. Some of entry methods can be done daily so be sure to stop back for more chances to win! 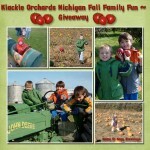 I am linking up with these great giveaway linky parties. 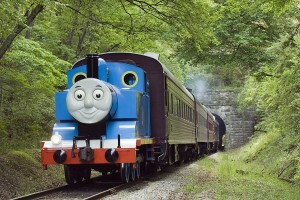 I have two little ones in my life that love Thomas ( and a nephew too!) We have had Thomas wooden railroads all over our living room floor. They just love playing with Thomas. There is one character named Flynn, who is their favorite!